It’s not every day someone discovers an entirely new class of variable stars. But that’s what astronomers at the Harvard-Smithsonian Center for Astrophysics appear to have done. Even more remarkable is the way they did it; by using photographic plates dating back to the late 19th century. The Harvard College Observatory (HCO) maintains a collection of over 500,000 photographic plates, dating from the 1880’s to the 1980’s. This collection is the only continuous record of that one hundred year period of the entire sky in existence. Every point on the sky has been ‘measured’ between 500 and 1000 times. The Digital Access to a Century of Sky at Harvard (DASCH) is a collaboration that has developed a high speed plate scanner in an effort to digitize the entire collection and make it available online. They have begun by scanning some 7000 or so plates in six different fields. 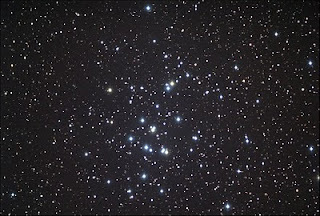 One of those fields, an area around the cluster M44 has yielded some surprising results. From 1200 plates, containing over 400 variable stars in the vicinity of M44 they discovered 3 unusual variables that changed by at least a full magnitude over unusually long time scales of 10-100 years. The first one, DASCH J083038.5+140713 (J0830 hereafter) appears to have faded more or less continuously, from 1880 to 1980, by a full magnitude. This star was previously discovered in ASAS data (ASASJ083038+1407.3; Pojmanski, G. 2002) and labeled as MISC, since it was noted to have become 0.3 magnitudes brighter in V gradually from 2003 to 2007, and then 0.1 magnitudes fainter from 2008 to 2009. DASCH J075445.9+164141 (J0754 hereafter) showed a sharp fading episode around 1930, and then slowly recovered over a period of 10 years. Another, earlier dip was shown around 1892, but unfortunately, due to the lack of data, the profile of the dip is lost in obscurity. There is just enough data to make it very interesting. To my eye it looks like another fading and recover could easily have been missed in the years 1990-2003. 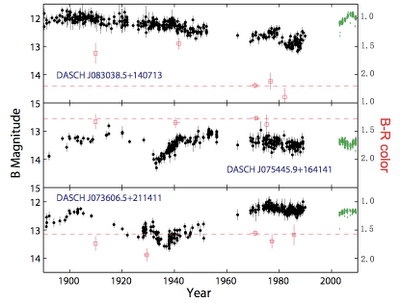 DASCH J073606.5+211411 (J0736 hereafter) exhibits a fading and recovery between 1930 and 1950 of about one magnitude. Over the entire 100+ year time of the data it appears to vary by 2.5 magnitudes or more. J0754 and J 0736 are new discoveries by the DASCH team. Both J0830 and J0736 appear to have become redder as they became fainter, but the evidence for this, from photographic plates, is sketchy at best. That is unfortunate, because if these fading episodes were caused by dust obscuration events we would expect the colors of the stars to be redder when fainter. Spectra taken at the F. L. Whipple Observatory and Gemini North reveal that all three stars are K2 giants, with a luminosity class of III. J0736 shows significant radial velocity changes at three different epochs, so it is probably a close binary. The other two appear to be single stars. According to current models, pulsations driven by ionization or convective instabilities cannot be sustained over time periods of 10-100 years in K type giants, so these are probably not pulsating variables. The light curves resemble those of RCB type variables (highly evolved carbon stars that exhibit dramatic fading episodes attributed to dust being coughed up into their atmosphere at irregular intervals) but none of them are post-AGB supergiants, like RCBs, and they are much cooler than RCB stars. The fading events are also much slower and not anywhere near as deep as RCB events. Some symbiotic variables show long-term changes and variation, but none of these three stars show any of the typical characteristics of symbiotic variables. So what are they? They may be some new form of dust creating variable, similar to RCBs, but it is hard to imagine a process that could produce and sustain dust events over such long time frames and with such a slight effect on the overall brightness. They could well be stars that have burned up most of the hydrogen and then helium in their cores and are now entering the stage where helium is beginning to burn in the surrounding shell. Stars entering this phase of evolution are believed to expand and cool, which would result in their becoming less luminous and redder. The bottom line is, there just aren’t any models for red giant stars that fit these three odd ducks neatly. We really don’t know what these stars are, other than they are variable stars of some type, most likely, some new type. It is important to note that stellar evolution in stars occurs on very long time scales, millions or billions of years. Evolutionary-driven changes occurring on human time scales of 100 years or less are rarely seen, and can only be discovered in data with 100 year or more time domains, like the plate collection at HCO and the AAVSO International Database. Only a very small percentage of the Harvard plates have been digitized due to a lack of funds. I hope that the DASCH team eventually realizes the dream of scanning and digitizing the entire half million plates one day, so we don’t need to collect data for another one hundred years to discover things that are already hiding in the Harvard plate collection, just waiting to be found. based on astrophysical criteria, and the ASAS3 data certainly confirm it. Nothing new in terms of variability type there then. The other two objects show things not unprecedented amongst post AGB yellow and orange semiregular (super)giants. post AGB variables with fading events are very mixed as to particulars of fade(s), although with general similarities, and often not even listed in the GCVS, or lost amongst all the other semiregulars if included. There aren't classic type star class names for these objects. Not all such giants are known to vary, and not all of them are in need of Helium or Lithium shell flashes to explain things. The classic well known K2 III supposed Thick Disc Giant Star is called Arcturus. Not that discovering new examples of these objects is not important, but there is nothing particular new about them. Great article Mike. Data mining rocks!!! One minor nit to pick - I think you are missing a word with "luminosity of III" - class /type after luminosity maybe? A whole new class of variable perhaps. That's cool. I wonder if these have any relation to "secular" or historical variable stars also thought to have possibly faded over millennia such as Denebola (Beta Leonis), Zubeneschamali (Beta Librae) and Alchiba (Alpha Corvi) - except those are very much the wrong spectral type - A rather than K.
I added the word class in to make it clearer. Thanks for the suggestion. It appears that anonymous above is slightly confused: though the first star shows all the spectroscopic signs of being an RS CVN binary, no radial velocity variability has been detected for it. The authors of the discovery paper instead mention that J0736 might be an RS CVN binary, which is also plausible, even though it's NOT as chromospherically active as J0830. Even if both stars ARE RS CVN stars, this is still excellent work as it shows decadal variations which are much larger than have been observed on all but a small handful of RS CVN stars (and that data is, naturally, also from the Harvard archives).